Summary: Undemanding and reasonably entertaining and the ensemble cast are worth watching. Farce isn’t a form that generally plays well in cinema. It really belongs on stage, brittle and artificial, trapped within the proscenium arch; in the more real world of cinema all its shortcomings tend to be highlighted. Nonetheless, Death At A Funeral isn’t as bad as it could be, saved by a couple of very funny performances and some amusing set pieces. Daniel (MacFadyen) is desperately trying to ensure that his father is given a dignified send-off, but senses that all is not going to go smoothly when the undertakers arriving with the wrong body. His wife, Jane (Hawes), will not stop asking him if he’s applied for a mortgage. Wannabe-writer Daniel is also nervous about seeing his handsome, successful, famous-novelist brother Robert (Graves), just in from New York. Driving up from London are Daniel’s cousin Martha (Donovan) and he new fiancé Simon (Tudyk), keen to make a good impression on Martha’s disapproving father. His plans are scuppered when he accidently swallows a hallucinogenic drug made by Martha’s brother, chemistry student and part-time dealer Troy (Marshall), on the way to the service. 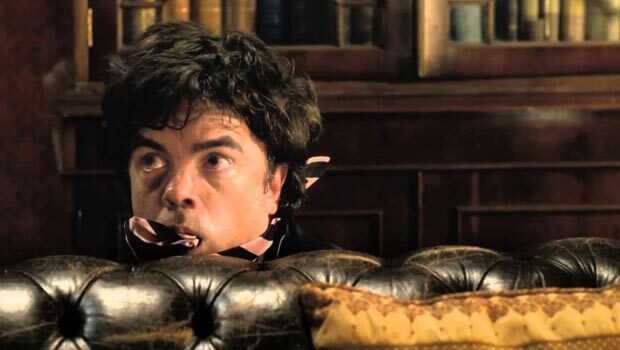 And then there’s Uncle Alfie (Vaughan) and his bowel problems, not to mention the mystery guest Peter (Dinklage), who knows an earth-shattering family secret. Frank ‘Voice of Yoda’ Oz does quite a nice job keeping the twists and turns coming in Death At A Funeral, and it clips along at a steady pace. The show is stolen by the two Americans – Alan Tudyk, one of the best actors in the business, once again doing a flawless British accent, and Peter Dinklage as the mysterious and not-terribly nice Peter. Matthew MacFadyen plays the straight man, as all around him descends into chaos, and while it isn’t side-splittingly hilarious, there are a few laughs. It’s undemanding and reasonably entertaining and the ensemble cast are worth watching. But it would work much better as a play.